Its moniker as intriguing as only fiction can be, the Bruce High Quality Foundation (BHQF) is named for an apocryphal “social sculptor” who “died” in the 9/11 attacks. Made up of a revolving group of several young and fiercely anonymous artists, mostly postgraduates of the Cooper Union college community, BHQF has been drawing attention since its inception in 2004 and in a few short years was already ranked among the most important art entities in ArtReview’s “Power 100,” in 2010. The “Bruces,” as they’re known (who also include women), specialize in smart, iconoclastic creations that serve as critiques of the establishment art world – a “curious mash-up of sober scholarship and juvenile pranksterism,” and a “brand of performance art that could be called the art stunt” wrote the Times in 2010 – and that, no matter how they’re described, have definitely caught on with audiences. Case in point is the group’s latest project (which can be seen through September 28 at the Lever House in New York City), a monolithic bronze called “The New Colossus,” or for most of us, “The Giant Rat.” Ain’t art grand? 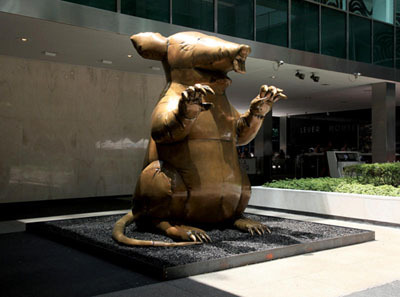 Part of a three-part installation entitled Art History With Labor, “Colossus” is a play not only on the name of the famous Statue of Liberty poem, but on the massive inflatable rodents (“Scabby the Rat”) often engaged by union groups in their protests with management. 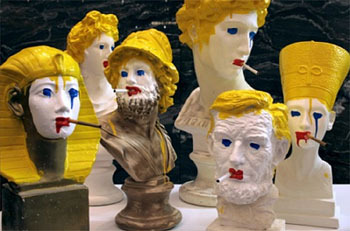 Previous undertakings have included the sculptures (shown above right) from Happy Endings, a series of “portable museums” that explored a number of themes at 2009’s Art Basel in South Beach, where it was definitely cool to be a Bruce. The collective (whose members keep themselves out of the public eye “not out of a distrust in celebrity, which proves useful, but out of a distrust in biography, which is not”), also stages its own “Brucennial” — an event they call “The single most important art exhibition in the history of the world. 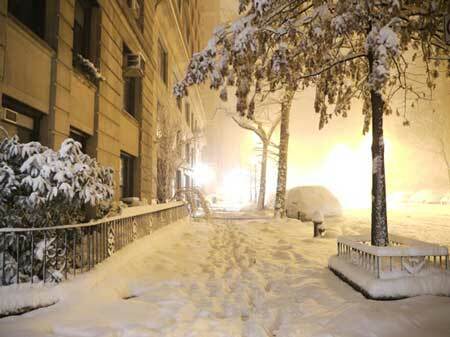 Ever.” — that coincides with the Whitney Museum’s celebrated Biennial every two years. It’s the kind of tongue-in-cheek hyperbole that’s come to be expected from this provocative group of irreverently edgy artists. 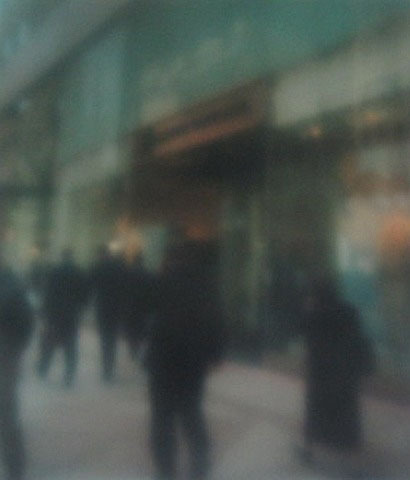 In one of several similarly themed images taken in the early 2000s, New York City-based photographer Bill Jacobson captures some of the moodiness and uncertainty that often accompanies the start of a new year.